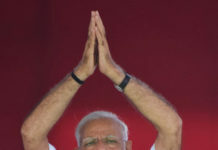 NEW DELHI: Indian Prime Minister Narendra Modi has hailed the decision of his government to construct Kartarpur Corridor and promised justice to the families of 1984 anti-Sikh riot victims, which shook the nation. “Kartarpur corridor project is an attempt to atone for the mistakes committed during India’s partition in August 1947. We had failed to ensure that the sacred site of Guru remains on our side of the border. 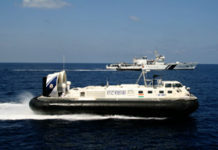 This project is authentic proof of compensating that loss,” said Prime Minister Modi. Once opened, Kartarpur corridor will allow Sikh pilgrims from India direct access to the historic Gurdwara Darbar Sahib in Kartarpur, Pakistan, where Guru Nanak Dev died in 1539. In November last year, both India and Pakistan did the groundbreaking ceremony for the construction of the corridor on both sides of the border. “Our government is working as per the teachings and ideals of Guru Gobind Singh ji. We are also preparing for grand celebrations to mark the 550th anniversary of Guru Nanak Dev ji,” said the Prime Minister in the event organised at 7, Lok Kalyan Marg. 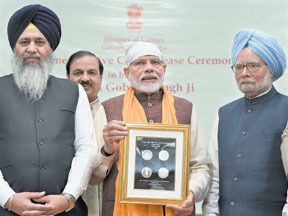 “Today, I have got a great opportunity to release the commemorative coin to mark the 352nd Parkash Purab of Guru Gobind Singh ji. His coin is already imprinted in our hearts for many years. It is, however, just a small gesture to pay respect and express our faith in his principles,” he said. “Guru Gobind Singh ji was not only a Guru (teacher) but also a great devotee. He was not only an exceptional fighter, but also a noteworthy poet and creative writer. He was against injustice and a firm supporter of peace. He sacrificed his own son to protect thousands of sons of the nation. Guru Gobind Singh ji is a true example of patriotism, peace, humanity, and patience,” Prime Minister Modi noted. ‘Despite his own struggles, he was always eager to sacrifice his happiness for others. Khalsa sect is a result of his hard work and esteem knowledge. He fought against the social evils like casteism,” he said. “The Dasam Granth, which is a separate religious text from the Guru Granth Sahib, reflects his incredible command over language and literature. All his teachings are being followed by us for the development of a new India,” added Prime Minister Modi. Former Prime Minister Manmohan Singh and a host of prominent Sikh personalities were present on the occasion. Next articleWhere there is smoke there is fire!